“The New Yorker” (links to the demise of a once great and noble institution) magazine has in part been a not insignificant component of the shaping of my world view-similar to a childhood friend in a way.That may sound nerdy sad and lonely but to anyone who spent their formative years in New York City it is well understood as a perfectly standard NYC upbringinging. Our family are as near to being archetypal native New Yorkers as is possible. Our family home was at 220 Central Park South-directly opposite Central park, for over forty years.CPS is the heart of Manhattan running from Columbus Circle to 5th Avenue-it is where the horse drawn hansom cabs park for out of towners to recall. CPS was also the heart of fashionable liberalism-another unique NYC aspect. It was John Lindsay’s “Silk Stocking” (so named for the shape) district for which he was straight out of central casting-NYC’s JFK as it were. At the lobby entrance to our building where the mail drop was guarded by the doormen there was always a big pile of New Yorker magazines ready to be sorted and pigeonholed. And what was there not to like about the magazine? The New Yorker in those days was witty, urbane, clever. It had a subtle, thoughtful social/political commentary which was never rude or loud. This included the cover too which was always of the highest quality. Great writers old and new, Capote, Updike, Nabokov, Salinger…well the list is endless, graced the pages, but for many, and especially myself, it was the cartoonists that were most looked for. The New Yorker was a “Hall of Fame” of cartoonists of both the general humor and satirical kind. Saul Steinberg, James Thurber, Peter Arno, Charles Adams are just a few of the great names of cartooning who brought both visual and cerebral delight. The magazine was, on reflection, a positive shaping element.This was more than just because the Eisenhower/Kennedy years were more sedate, rather that the old fashioned liberalism of the magazine’s tone reflected an open, courtly and positive liberalism. I believe holding to this attitude today is no anachronism for a “recovering liberal”. I believe it fits in perfectly well with the now holder of a Palin world view (as I see it). Concern for the disadvantaged, which is to be remedied by a small government, acting as a social guarantor, and living within its means and with a strong foreign policy, were the hallmarks of the Eisenhower/Kennedy years prior to LBJ and are pure Palinism today. 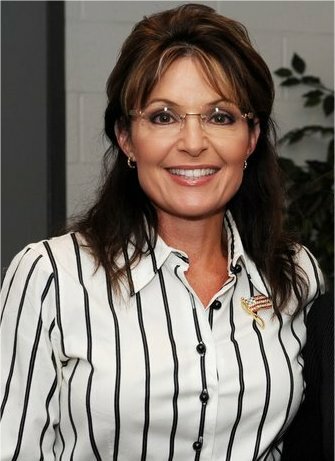 It is deeply saddening to see the depths to which this once venerable magazine has sunk as it embraces all the grossly negative aspects of the modern liberal left.The absolute garbage which is the ranting of their “television critic” as she “reviews” Palin’s TLC Alaska documentary, exceeds even the lowest of the overtly leftist trash on execrable blogs like Gawker which makes no pretense of being anything but a trash site. What do the editors possibly have to gain by running this sort of “review”. Are they in such deep circulation problems that they have to resort to (which failed miserably) the sort of anti-Palin gimmick that Newsweek did with their notorious running shorts cover? New York is so deeply blue that they are preaching to the choir,certainly no ones mind would be changed reading such slanted material. No, it is all so very sad. It is like seeing a childhood friend end up on drugs and sleeping rough. On the positive side it goes to reinforce to my mind that the progress I have made from liberal to conservative is correct. The liberal left today is unrecognisable to me in all its perverse grossness-allied to a disgusting elitism. I would frankly consider myself less of a person if I was still a ‘liberal”. This is no place for cursing, no reason to stoop to their level. However, for those who loved the old New Yorker the wonderful Linotype errors, which were placed at the end of the serious articles, will suffice as a sad imprecation at those who have let such a wonderful institution fall to the dust to cope with their Palin fear and hatred “etoin shrdlu shrdlu shrdlu”. Camille and I have a great show lined up for this Thursday night (11/11). October’s shows were full of great guests- everyone from Bristol Palin and Eddie Burke to Joe Miller, and November is expected to be just as great! We are pleased to announce that we will be joined by phenomenal blogger and political contributor Jedediah Bila. Camille and I first got to know Jedediah via Twitter when we were helping with Eddie Burke’s campaign for Alaska lieutenant governor. Jedediah was nice enough to conduct a Q&A with Eddie that was published in the Daily Caller. For those of you who know of Jededidah’s work as a writer and commentator, not to mention an upcoming author, you know that she has an amazing way with words and the quality of her work is both fair and honest. Her work is a favorite of Mark Levin and Shaun Hannity. 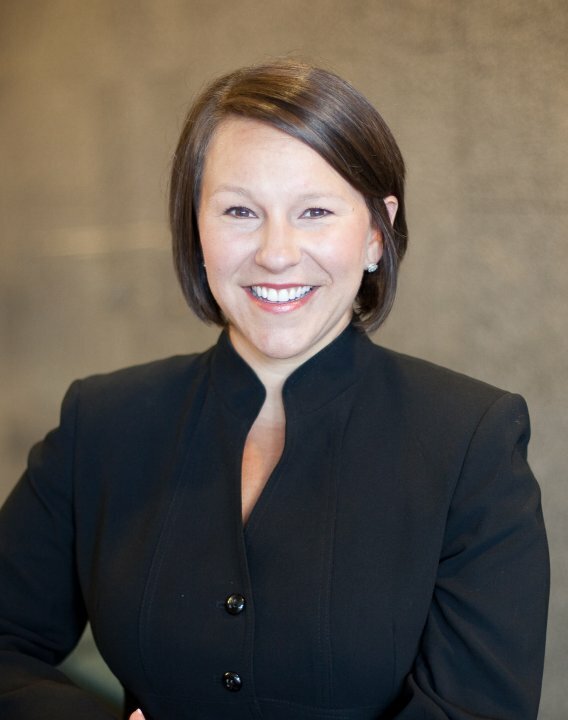 She is a regular on the Fox News Channel with regular appearances on Hannity and Red Eye. Camille and I cannot wait to talk with her about the mid-term elections and the rise of women in politics. Make sure to tune in this Thursday night at 7 pacific/10 eastern to The People’s Post. You can listen online at blogtalkradio.com/thepeoplespost-live. Bristol and Mark danced the Argentine Tango for their individual routine last night and the Samba for their Instant Dance routine, for which they picked their music out of a bowl of CDs 20 minutes before they performed. Bristol received three 8’s for her performance of the Argentine Tango and one 7 and two 8’s for her performance of the Samba. Her combined score was 47/60 and placed her at the bottom of the leaderboard. Since fans’ votes are weighted equally with the judges’ scores, hopefully our votes will help Bristol and Mark go on to the semifinals in Week 9 DWTS. Bristol and Mark talked to a reporter after the Week 8 competition. Mark said that Bristol’s performance was her best all season. He thought her Argentine Tango was better than the Viennese Waltz that she had scored three 8’s with previously and that she was underscored last night. Mark also mentioned that Bristol was docked one point because he made an error in the routine, and he did not think that Bristol should have been penalized for that. He said that Bristol did not break her rhythm in spite of his error. Voting has just ended for Week 8 DWTS, so we will know the results tonight. Hopefully, Bristol and Mark will go on to Week 9 and beyond. We would love to see them take that mirror ball home! The midterm elections are over, but Sarah Palin is proving she’s not done shaking up the system and diving into major policy issues. On Monday, in a keynote address at a trade-association convention in Phoenix, Palin tackled the issue of “quantitative easing,” which is when our government pumps money into the banking system by buying up treasury bonds. Just last week, the Fed said the plan is to purchase $600 billion of U.S. Treasury securities by the middle of 2011. In addition, the Federal Reserve has announced that it will be “reinvesting” an additional $250 billion to $300 billion from the proceeds of its mortgage portfolio in U.S. Treasury securities over the same time period. So that is a total injection of about $900 billion. BusinessInsider.com asks, “Have we now reached a point where the Federal Reserve is simply going to fire up the printing presses and shower massive wads of cash into the financial system whenever the U.S. economy is not growing fast enough?” . . .
Sarah Palin Asks: Do Wall Street Journal Reporters Read the Wall Street Journal? An excellent smack down by Sarah Palin as well as proof that some people are so biased against Sarah Palin they forget their own ideas and in this case, writings, mirror hers. How stupid is that? Do Wall Street Journal Reporters Read the Wall Street Journal? Ever since 2008, people seem inordinately interested in my reading habits. Among various newspapers, magazines, and local Alaskan papers, I read the Wall Street Journal. Now I realize I’m just a former governor and current housewife from Alaska, but even humble folks like me can read the newspaper. I’m surprised a prestigious reporter for the Wall Street Journal doesn’t. People we are in grave danger. What the Fed is doing can destroy the nation. Sarah Palin is one of the very few out there actually speaking up. We don’t have time for petty politics and other such nonsense. It’s quite obvious who our leader is. It’s time to get behind her and put the silliness on the back burner. In a speech delivered on Monday In Phoenix, Arizona, Sarah Palin slams Fed Chair Ben Bernanke and the Obama regime’s insane plan to monetize the debt. Sarah is right, of course. Hyperinflation will destroy America. In fact, the historical evidence of this is so strong, one might think that is the purpose of this dangerous path. It’s like the Obama regime is purposely destroying our nation. Surely the Marxist-democrats aren’t this stupid, are they? One of the most well known cases of monetizing the debt occurred in Germany in the 1920s, and led to the collapse of the Weimar Republic. This led directly to the rise of Adolf Hitler and National Socialism. It also led to the ridiculousness that included needing a wheelbarrow full of German marks to buy a loaf of bread. It was a complete disaster. Surely the Marxist-democrats know this, and one must wonder if the total collapse of America isn’t their end game. This is a very serious matter and if the Obama regime and the Fed are not stopped, we could not only see the collapse of the United States, but the entire world’s economy. Again, one wonders if something like this isn’t by design. As Reuters reports, China and Russia are most certainly alarmed, and Obama just keeps on keepin’ on. If the boys don’t catch up quickly, it could be evening in America for them. This is a great exchange between Michael Reagan and Megyn Kelly about Sarah Palin and her chances for 2012. They are discussing, among other things, the new SarahPAC video which you can view here. Michael is spot on. Sarah Palin brings an energy, a passion that we have not seen since his father, the great Ronald Reagan was motivating Americans to stand tall and proud. No one else in America has the ability to inspire that Sarah Palin does. Sarah Palin didn’t go to Harvard, or fiddle around in urban neighborhood leftist activism while engaging in opportunism within the ranks of one of the nation’s most corrupt political machines, never challenging it and going along to get along, like Barack Obama. That was quite lofty praise at the time, for sure. But since then, Sarah Palin has not only lived up to this praise, but exceeded it wildly. Sarah walked on the national stage and seized the moment like no one has in recent memory. 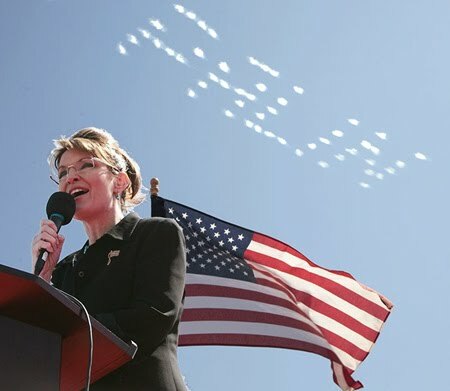 Like Reagan before her, Sarah Palin loves America and celebrates American exceptionalism every day. Her leadership will shape America for decades to come. As Michael rightly points out, she is rebuilding a younger, smarter, bolder, more Conservative Republican Party. And that is a good thing! For the record Sarah endorsed 94 candidates in local, state, and national elections, 60 won, 31 lost, with the remaining races undecided. A new Rasmussen Reports national telephone survey of those voters finds that 82% have a favorable opinion of former Alaska Governor Sarah Palin, the party’s vice presidential nominee in 2008, while just 17% view her unfavorably. That includes 50% with a Very Favorable opinion and eight percent (8%) with a Very Unfavorable one. This is quite a significant rise in Sarah Palin’s approval ratings, which have consistently polled in the low to mid 70s. Obviously, as her favorables have risen, her unfavorables have lowered significantly as well. These numbers are getting close to her pre-vice presidential run approval numbers when she was Governor of Alaska, where her numbers were consistently in the high 80s to low 90s. The top numbers of any Governor in the Nation at the time. For more polling results, go here.